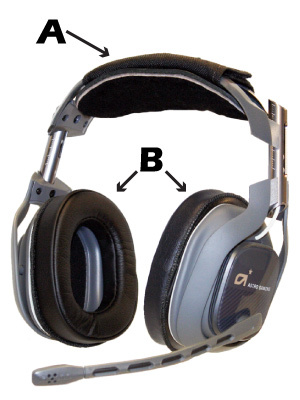 What traits do you look for when shopping for a gaming headset? Sound quality, style, brand, wireless or wired, built in amp? Regardless of your preference, is comfort a factor? You betcha! Sure, It felt fine when you tried it on at the store but how does it feel after gaming all night? Before boxing it up and making a peace offering to the opposing team consider upgrading it with an EDGE by Oregon Aero Upgrade Kit? Our kits are engineered to eliminate headset pain so you can stay in the game. Oregon Aero has been upgrading aviation headsets for civilian and military pilots and crew members since 1989. We now offer the same tried and trusted upgrades for gaming headsets. The SoftTop installs over your existing headband cushion. This plushy, genuine sheepskin cushion eliminates painful pressure points by distributing pressure evenly across your head. Self-wicking sheepskin padding helps keep perspiration at bay while keeping your head cool—or warm. The SoftTop cushion secures to your headband with a durable nylon hook/loop wrap. SoftSeal Ear Cushions have more internal space than stock cushions. Our cushions are designed to fit over your ears instead of crushing them. Pressure and temperature-sensitive visco-elastic form core conforms to the shape of your head to form a tight seal—even if you are wearing glasses or earrings. Foam cores are covered in comfy and durable synthetic leather material. SoftSeal Ear Cushions are easy to install with included adhesive rings or flanges. The type of mount used varies with headset model.